Properly taking care of parakeet chicks involves taking good care of their parents. Both the mother and father raise the babies, each with their own role to play. If you're lucky, your role consists of providing plenty of food and water to the parents, cleaning the cage and waiting for the babies to fledge. If you're not so lucky, you could have to hand-rear your parakeets. Little girl looking inside parakeet bird cage. Female parakeets lay between four and six eggs per clutch. The mother bird sits on her clutch for 18 days, prior to the chicks' hatching. Baby parakeets depend completely on their parents for food. Newly hatched parakeets -- naked as the proverbial jaybird -- can't see and have limited movement. Parakeet hatchlings can't bring their heads up to signal to their mother that they're hungry. However, they can cheep; it's to the noise that the mother responds. Their mother takes care of all their needs in their first weeks of life, feeding them with a mixture of seeds and her saliva. When the weaning process starts, at about four weeks, Papa Parakeet takes over. In the wild, he's the one who teaches his offspring what kinds of foods -- primarily seeds -- they should eat as they get ready to leave the nest. In captivity, the dad will assume this role with the foods you provide, including standard parakeet rations. You also can give your birds some fresh greens, including carrot tops, spinach, dandelions, kale and small amounts of fruit. In the wild, parakeet chicks leave the nest at the age of 1 month. Domestically raised chicks might stay with their parents a week or two longer, but you should remove the chicks by Day 42, especially if their father is still in the cage. At that point, he's ready to breed again and wants his prior offspring out of the way. If you don't remove the fledglings, the male bird could become aggressive. If something happens to the mother parakeet, or if she refuses to care for her chicks, you must take her place. You can feed parakeet chicks with a small syringe, cleaning the instrument thoroughly after each use. 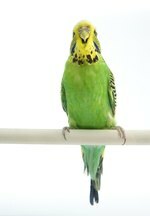 You can find baby bird formulas in pet stores, or ask your vet for a recommendation. Use boiled water for formula preparation, letting the mix cool before feeding. Don't use a microwave for preparation, as it can cause uneven heating. Tap the chick's beak gently, a signal for him to open his mouth. At any angle, direct the food to the back of the mouth. Allow the chick to swallow before pushing the plunger each successive time. The chick will close his mouth and refuse to eat once his crop is full. Repeat the feedings every two hours from early morning until midnight. Gradually increase the amount of food each day. By the second week, you can start feeding every three hours, and every five hours by week three. By week five, begin weaning by adding bird seed, fresh greens and breadcrumbs to the diet.